This article was originally published in the NEA Today. In the summer of 2017, Charleena Lyles, a pregnant 30-year-old black woman was fatally shot by two white Seattle police officers in her home as her three young children looked on. Lyles, who had called the police to report a burglary, reportedly suffered from mental illness. She pulled a knife out of her pocket when the police entered her home, but rather than tasing or subduing her with pepper spray, they shot her seven times. Days after the shooting, seven black Seattle high school students formed “New Generation,” a school activist group that led a walkout at Garfield High School to raise awareness about the young mother’s death and to organize in their school and community for racial justice. The death of Lyles is a symbol of the injustices the group of students has experienced and witnessed in their communities and even within their school. They wanted to take action not just for Charleena Lyles but for all people of color, especially their fellow students. New Generation receives the “Black Education Matter Student Activist Award,” supported by Pele and Michael Bennett and Linda Sarsour. “We’re students of color and we share similar struggles, experience the same disadvantages, and strive to become more than what society has labeled us,” says Chardonnay Beaver, who founded New Generation along with classmates Janelle Gary, Myles Gillespie, Kevon Avery, Israel Presley, and Umoya McKinney. New Generation was a recipient of the 2018 Black Education Matters Student Activist Awards (BEMSAA), which gives recognition, support, and a $1,000 award to student leaders in the Seattle Public Schools who demonstrate exceptional leadership in struggles against racism—especially with an understanding of the intersections with sexism, homophobia, transphobia, Islamaphobia, class exploitation and other forms of oppression—within their school or community. Over the past three years, nine Seattle Public Schools students and one youth organization – New Generation — have been honored with the award. The program was founded by Jesse Hagopian, an Ethnic Studies teacher and co-adviser to the Black Student Union at Garfield High School in Seattle. Just like New Generation was spurred by violence, the award program was a positive outcome of a clash with police. Jesse Hagopian is pepper-sprayed by a Seattle police officer. 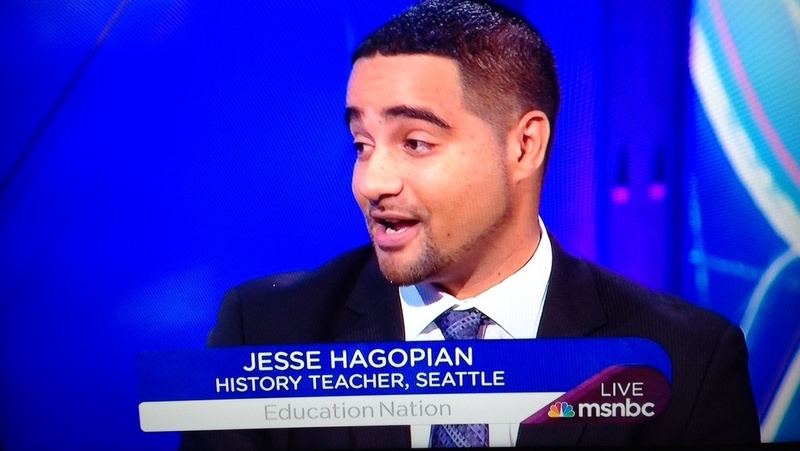 In January of 2015, Jesse Hagopian gave the final speech at Seattle’s peaceful Martin Luther King Day rally. Shortly after, while the crowd dispersed and he was on the phone making arrangements for his son’s second birthday party, he was pepper-sprayed without provocation by an officer of the Seattle Police Department. The incident was captured on video by an onlooker. He was ultimately awarded a settlement over the incident with the City of Seattle and used a portion of the proceeds to start the Black Education Matters Student Activist Award. Activism is at the heart of this award, Hagopian says, and all of the award winners have taken some kind of bold action to undo institutional racism. “The examples are breathtaking,” he says. One student organized a citywide movement to get for free bus passes for low income students. Another student started an Islamophobia global awareness day. One group got the Seattle School Board to endorse “Black Live Matters at School” and week of action, a movement that has spread to other cities and districts. A group of students fought for the addition of an Ethnic Studies program that is transforming Seattle’s schools. Hagopian encourages other educators to find ways to support youth who are organizing for a better world. The best place to start, he says, is at the school and district level and to build relationships with students and support activist work with mentorship. A recognition program becomes much more powerful if there is a cash award and media coverage. He suggests grants or GoFundMe campaigns and seeking partnerships with artists and athletes, as he did with former Seattle Seahawk Michael Bennett and Grammy award winning artist Macklemore who generously help fund the award program. Chardonnay Beaver of New Generation said receiving the award was an unforgettable moment for all of the group’s members. Learn more about the award program at blackeducationmatters.org where you can learn about previous winners and nominate students for this year’s award.